Note: All photographs are courtesy of Don Nelsen except where indicated. Click on any photograph for enlargement. "DON, KEEP the rope TIGHT!" - I shout. Truth is, the rope would have done no good had one of us slipped. The route is now ICE, making self-arrest a most daunting proposition. The resulting slide would end on the boulder slabs, taking one and all on an unwelcome journey to the emergency room - or worse. Reaching the rock without incident, we still cannot rest - it's 7:30 p.m. and there's still a glacier to cross ... before darkness! Still it is well to finish with this evil and threatening downclimb. I for one even dare contemplate supper - a thought which, owing to its benign content, suggests that our worries are now on the downswing. On this SUMMIT DAY everybody is tested. 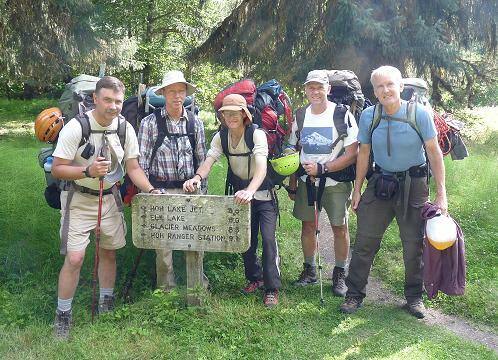 However none more so than Don and Ken for whom nothing quite this tough has come their way - except Mount Olympus. This story is our story, with emphasis on the journey as it unfolds before us. No attempt is made to document how one climbs Mount Olympus, as adequate information resources are available elsewhere. 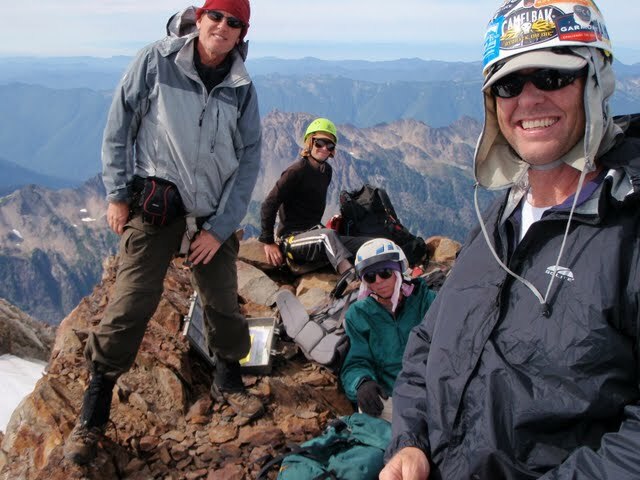 Idaho, Montana and Washington county highpoints in late July and August 2009.
the Mount Olympus summit massif. 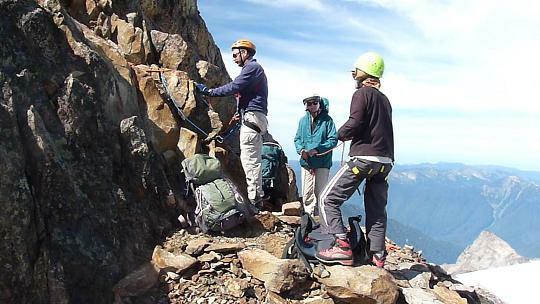 Being on several peak lists, each of us has a different reason for climbing Mount Olympus. For Dave it is chiefly the highpoint of Olympic National Park. For myself it is a "vengeance peak", having failed to climb it two years ago owing to an array of causes. 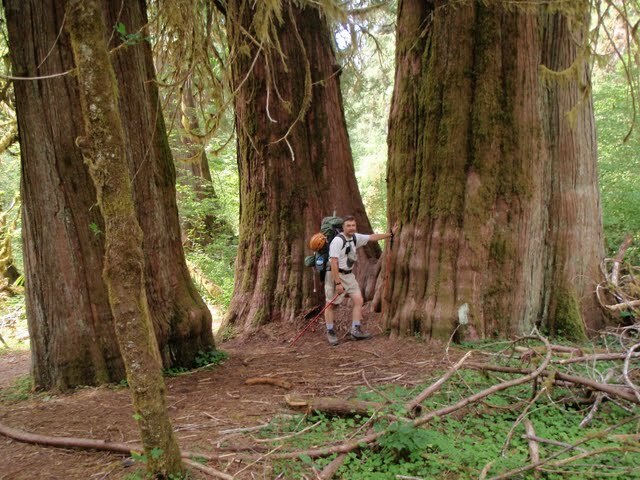 I need Olympus to complete the county highpoints of Washington - in turn, part of an even grander plan to climb all 414 counties of the eleven contiguous western states. and that when coming from just one of several possible directions. A total elevation gain of 9,000 feet. A crossing of the Blue Glacier with all the attendant skills and techniques. by a short section of moderately steep snow. In addition we are faced with poor route conditions owing to lateness in the season. 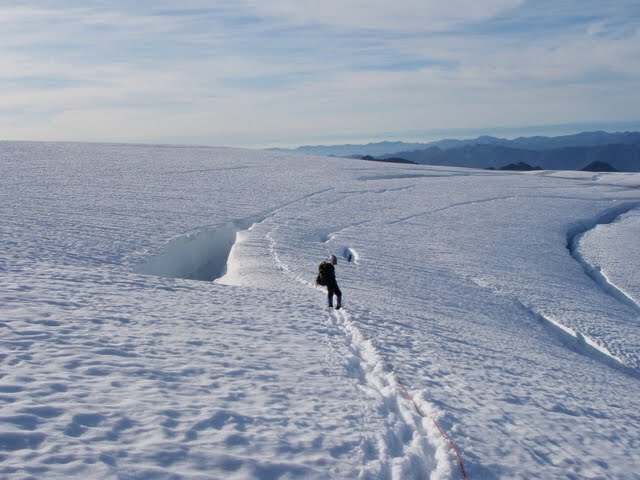 The Blue Glacier is snow-free; and, although this lays bare otherwise hidden crevasses, one is continually walking up, down, through, and around ridges of ice. 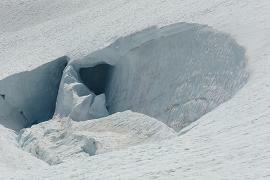 The Snow Dome has parallel crevasses that are readily seen and avoided. However certain crossings of snowbridges are tenuous, and require wanding for the return to remind one of their exact locations. A two or three-foot wide moat makes problematic the transfer from steep snow to the final rock climb. Here one wears crampons which make any attempt to walk on rock ungraceful, tedious, and dangerous. Descent from Snow Dome to the Caltech rocks is, at 7 p.m. late enough that this east-facing slope is shaded. 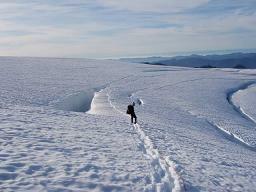 The route, snow on-ascent, is now largely ice - and as described above in the opening paragraph. ALL of these issues make the peak harder than otherwise. However this APEX status actually draws us to the peak: I am certain that Richard Carey would not drive clear from southern California to climb a walk-up! Before Mount Olympus I had climbed with all team members except Ken Russell. To myself Ken is a wildcard. However he is trained extensively by the Mountaineers, the venerable, Washington-based group of climbers who revel in the steep, craggy summits of their chosen state. Mount Olympus is also an ultra prominence, i.e. one of 57 peaks in the contiguous USA with at least 5,000 feet of vertical relief (a more correct technical definition is available). 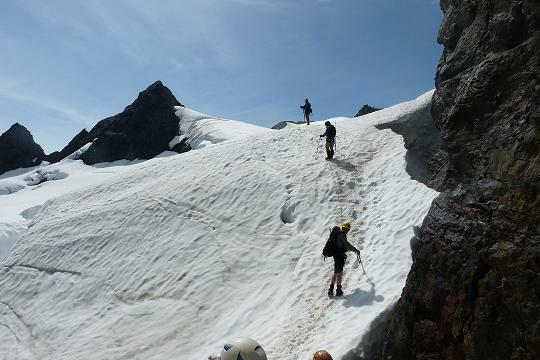 Owing to all these superlatives, Mount Olympus is a "must" for the list-driven climber and the hard-core mountaineer. It's remarkable how four people successfully converge to the same space-time continuum point. That is, all but Ken who lacks a cellular phone. So here we ARE in Port Angeles, set to enjoy a meal at some moderately decent seafood establishment. It is at once an opportunity to socialize before the "main event" and for packing in calories to that end. Adam Helman, Richard Carey, Ken Russell. I start with a mango margarita; others enjoy imported beer. My entrée is shrimp in a spicy onion and tomato broth - and enhanced with grated parmesan and garlic from my personal supplies. Dave gets this insanely large seafood salad that has me doubt it can be consumed in under an hour. For dessert I enjoy a brownie sundae with strawberries and whipped cream. We are "stoked" and excited by a flawless weather forecast, contrasting with a spell of rainy weather the previous week that saw me climbing nothing over four days. The wonderful weather prospects markedly improve our success chances like nothing else can! Ken has eaten separately, and, after discussing who carries what group gear, we sleep by ten in either of two rooms. Imagine their size when fully grown! The next morning we caravan west along Route 101, stopping after 57 miles at Forks for a hearty breakfast. I don't usually eat breakfast, but make an exception on finding biscuits with sausage gravy on the menu: something I have not enjoyed in quite a while. We continue, now south, 13 miles to the Hoh River Road junction leading into the national park. After 18 miles of windy pavement we arrive at the jam-packed combination parking lot / campground / trailhead area. It is a free-entry weekend, and we are forced to drive around for empty spaces. 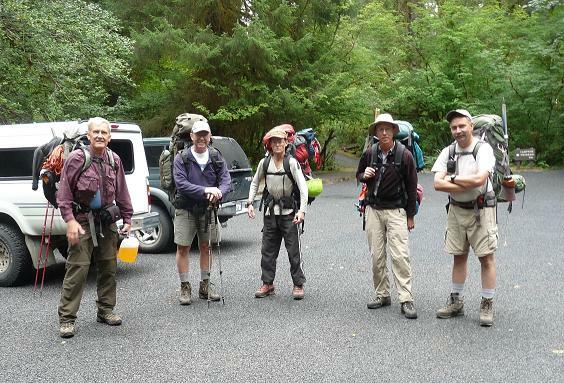 After the requisite photograph session, and with heavy packs for all, we walk several minutes to the actual trailhead. There, the vast majority of folks come for a peek, a mere hint of the rain forest as enjoyed over short and level trails which loop-back to the headquarters. In contrast, our backpacks lay bare to all our peculiar, lofty and distant goal. I pity this mass of humanity, with their overburden of flabby flesh, for they will never know the extreme pleasure, pain, misfortune, and joy of testing one's limits. "Torrential downpour". That's the best descriptor for how to create a RAIN FOREST at the 48th parallel. 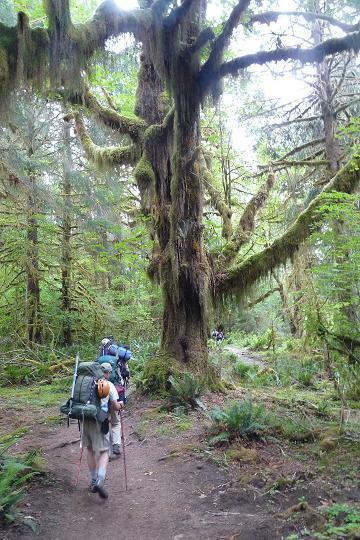 Most Americans would be surprised to learn that within their own borders a rain forest exists. Yet it DOES - and to walk through it is surely one of the more unique approach hikes to any mountain in our land. Savor the experience. I am not a botanist. However I do appreciate the bountiful, almost overwhelming display of flora this day. First-off, the gigantic trees. They are immense. When fallen, a nursery is created for all manner of tiny plant life - a sort of mini-ecosystem delimited by the available surface area of one dead tree's upper and side-sloping surfaces. Trees also fall in blowdowns - fierce windstorms that commonly wrack the coastal area during the colder months. Fortunately the trails are cleared by work crews, at least on an infrequent basis. Else, walking around or even over these behemoths with a full pack would be most unwelcome from both energetic and temporal aspects. There are ferns, mosses, lichens, flowers - a panoply of life defines the understory. Were I not to have 55 pounds on my back there could be time for pause and enjoyment. Unfortunately we are merely passing through, bound for a remnant of the ICE AGE while amidst a sea of greenery. Juxtaposition of a rain forest and a glacier on the same effort is most unusual. We stop once an hour, our progress acceptable. At 9.1 miles we halt at the manned Guard Station. There we hear more tales of poor route conditions from the on-duty ranger. I hedge on every word - these park rangers invariably paint a gloomier picture than reality suggests. I suspect this is an intentional effort to deter us from our appointed rounds since a) they don't care if we summit or not; and b) they don't want to deal with an emergency situation if it can be avoided. By deterring us into a non-effort the latter is ensured. figure caption (a 1-in-120 chance) . 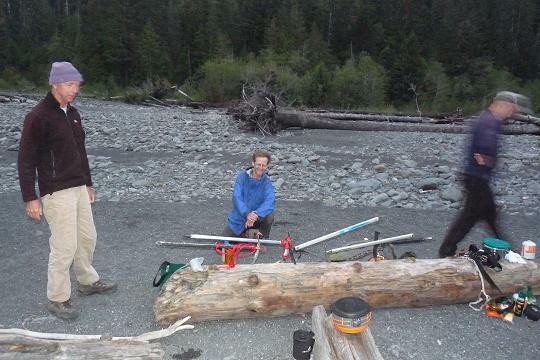 Our site is Lewis Camp on a gravel bar along the Hoh River at mile 10.5 . It is a good place - largely bug-free and near a copious water source. Don, unbeknownst to at least myself, has carried fresh vegetables - and eagerly prepares them to share with us after I've eaten my pasta meal. The sheer mass of his fresh food astounds me since it is not standard practice to carry low-calorie fresh food on overnight affairs. Regardless, a melange of green beans, onions, potatoes and carrots in butter sauce is tasty. Their vitamins are an added bonus. Having fun with ice axes at camp. Furthermore, everybody is happy to share food. This is gratifying since more often than not I am the major recipient. This occurs not from selfishness. Rather, I **need** all the energy I get hold of because I am too skinny to lose weight - and backpacking or climbing for hours on-end burns an enormous amount of energy: more often than not, exceeding the amount one is willing to carry. In addition, shouldering one-half my weight is something nobody else has to do - a feat never truly appreciated by climbers who weigh a more "normal" amount. There are wires to tree-hang our food. Viewing the threat as minimal, I stash my food just outside the tent; with a bunch of stones available to throw in case something big and black comes our way. This day offers the challenge of significant elevation gain. Our goal is Glacier Meadows, some 17 miles from the trailhead at 4,300 feet and within striking-distance of the summit. 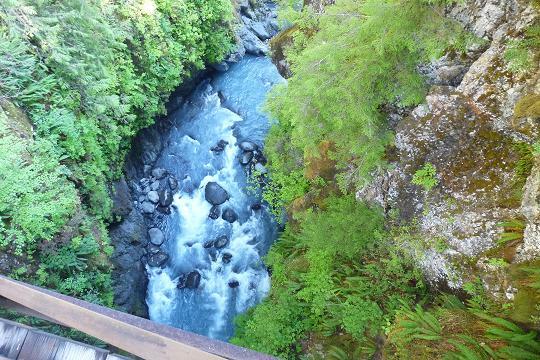 A spectacular view is afforded by a high bridge crossing of the Hoh River at mile 13.1. After that point it is uphill clear to our afternoon's goal. below the high bridge crossing. The pace is slow to accomodate everybody - in fact, annoyingly slow for myself since I can get to camp two hours earlier were I to set my own pace. I am in great aerobic shape, having climbed all summer and having trained to climb Denali (Mount McKinley) last June. Anyhow, for the sake of maintaining group cohesion I stick with the others. A significant obstacle is an avalanche path intersecting the trail perhaps 1/4 mile before Glacier Meadows. 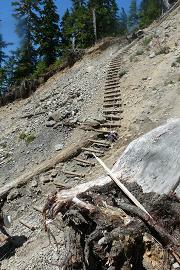 The trail crossing it is now so bad that the Park Service maintains a rope ladder that one downclimbs perhaps 75 vertical feet; only to face a horribly unstable scree slope which regains the lost elevation. 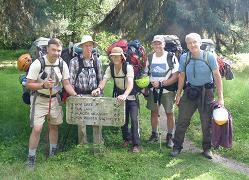 Having sped ahead of the team for the last mile, I arrive in camp to select a group site. When others arrive a different site is chosen a bit closer to stream water and less in the direct view of other campers. There is some time to relax - and I make a pint of cinnamon spice pudding around 4 p.m. so that I don't dive into my next day's snack food supply - nor eat my evening food prematurely as then there is little to eagerly anticipate. We sleep after dark falls sometime before ten, having agreed to a 3:45 a.m. awakening. I sleep well despite the six hour timeframe. After climbing Bonanza Peak last month, I can confidently handle the climbing issues. Don, however, has not slept a wink due to an infected blister developed yesterday and has reservations about even going. Nonetheless we all negotiate this narrow trail at 4:48 a.m., by headlamp, our departure timed as to hit a steep, loose scree slope at first light. Early morning views of the Blue Glacier and our intended climbing route are at-once inviting, beautiful, and spectacular. The glacier truly does have a slight bluish tinge - as do many examples of highly condensed water in the solid state. 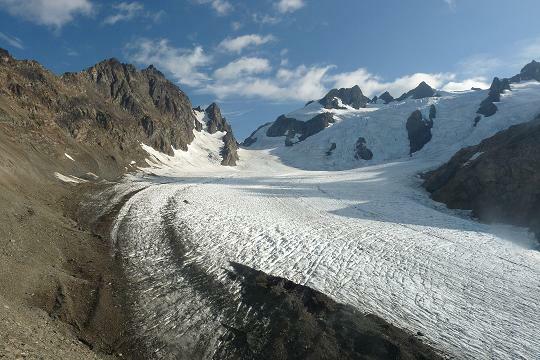 We walk atop the terminal moraine for its entire length, and then descend 220 feet to the glacier's rocky edge. A climbing party had left one hour before us, and we use their route as a sort of template for guiding our own path across the somewhat linearized, striated terrain. We consume time roping ourselves and emplacing crampons. The nearby ice creates its own weather - suddenly it is only 43°F, down from a balmy 57° atop the moraine, and with a wind to further chill us. I start shivering, and so am quite anxious to get going! as we near the Caltech Rocks. Don has some negative feelings about his ability to continue due to his aforementioned lack of sleep and some resulting dizziness - not a good combination for any climb and especially not so for this one. We submit that stopping on the ice and waiting for us is not a good choice should he decide to abort - no, once started, Don must at least continue to the rock slabs. We use two ropes - a long, 60 meter (197 foot) rope for Dave and Ken; and a shorter 30 meter violet rope for Richard, myself, and Don - in that order. Dave leads across the ice. I was to have lead as discussed last night because I could be more readily pulled-out in case of a crevasse fall. However there are no hidden crevasses: all is ice with no hint of snow. Richard (lead), Adam, and Don (rear). Crossing the Blue Glacier is tedious, and yet there is no point where we must divert a large distance to avoid some crevasse. The longitudinal striations are many; and we generally travel along their highest ground much as one would a narrow ridgeline. After perhaps an hour we are largely across the icy expanse; and direct sun makes for pleasant weather. I may be mistaken, but I do believe that this glacier travel is new to Don. 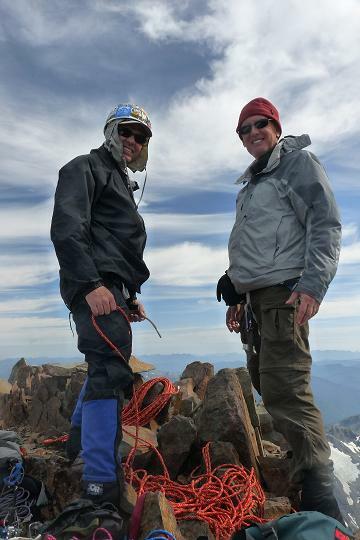 It might also be new to Ken as he is only now starting a climbing career - one that has not (yet) seen him at Mount Rainier or Mount Baker, major glaciated volcanoes that are near or at the top of any Washington resident's climbing agenda. with the summit massif in-sight. Glacier travel immediately earns a Class 4 rating since a rope is used. Of course, on falling into a crevasse, one is suddenly immersed in a world of vertical ice! My left crampon is not properly sized to the boot, which is odd because it fit perfectly at Bonanza Peak just one month previously. With Dave's assistance and some mechanical forcing it is correctly re-sized and we can proceed. The venue already in-mind, I promise to treat him with lunch at our celebratory, post-climb meal. The route steepens bit-by-bit until reaching rock slabs where crampons are removed. We scramble on slabs for the next 300 or 400 vertical feet; whence we find ourselves at the base of a moderately-angled snow slope leading to the Snow Dome. Crampons re-attached, we zigzag upslope, the mean angle being perhaps 40 degrees. On-top we take a deserved rest, lead climbers reeling-in their companions in-case of a crevasse issue. The Snow Dome is broad, and slopes almost imperceptibly uphill, facing south, as it leads to a series of rocky summits the highest of which is our goal. The Snow Dome is most smooth, and contrasts sharply in that regard with the Blue Glacier now over a thousand feet below. Hideously convoluted ice falls and seracs comprise much of the upper Blue Glacier; and yet now are just level to our sights. I think the closest we'll get to them is through the focus of a telephoto lens! The skyline opens for many miles, and we peer down into nearby valleys that seem like nothing but luxuriant green carpets. We have been blessed with beautiful weather; conditions that allow us freedom to climb leisurely rather than the hurried apprehension of one trying to summit and get down before an approaching storm. I know that feeling all too well from Colorado, where one is nearly guaranteed thunder and lightning after the noon hour. However not today. We travel in-between obvious, parallel crevasses. At one point Don breaks-through a snowbridge even though the rest of us do not. We emplace wands, carried by Richard and removed by Ken from Richard's pack, wherever a key section requires marking. 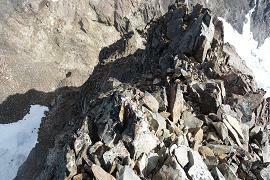 Just before Crystal Pass and at 7,000 feet is this problematic traverse where a slip will take you into a large, bottomless "hole" if unable to self-arrest. It may lead clear to the Indian Ocean for all I know!! We cross most gingerly; and, several minutes later, cross Crystal Pass and break briefly on the far side. Other climbing parties are on or near the summit, including one from the Mazamas climbing group. We must coordinate our own efforts with theirs to avoid a "traffic jam" near the top. 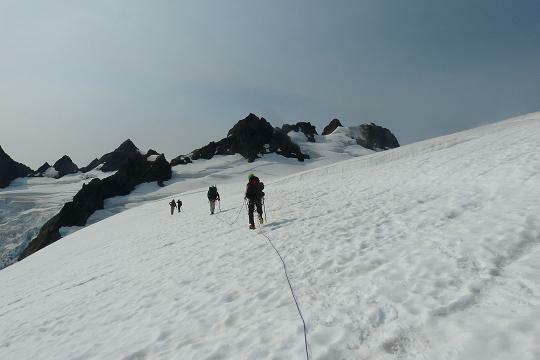 Thus with climbers on the near, south side of the summit we rock-hop to the base of a steep snow slope for a northern approach. Crampons re-attached, we climb 50 degree snow (perhaps 75 or 100 vertical feet); and top-out on a level portion just under the north face. Our immediate problem is crossing a moat that separates the rock from our snow. 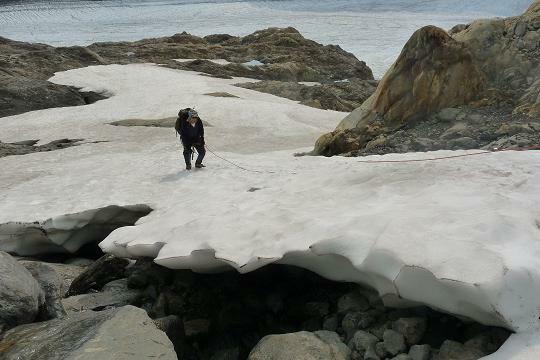 Unfortunately to reach the initial rock scramble ("The Sidewalk") requires downclimbing some hard, nearly icy snow for 15 feet. Dave kicks solid steps for others to follow-in precisely. We belay one another for this portion. 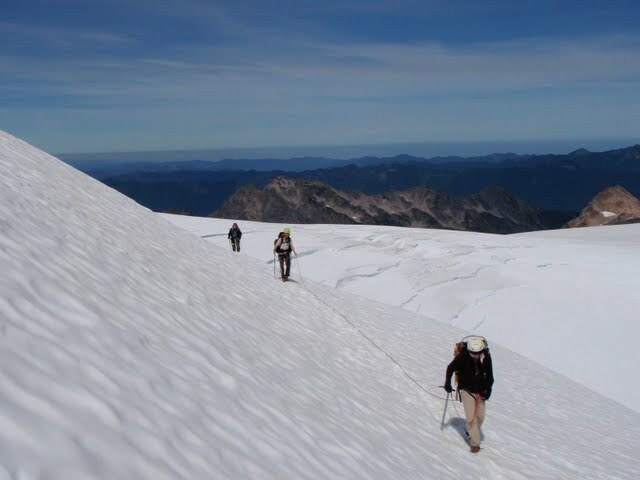 I downclimb carefully, and find it more challenging to transit from snow to rock while still sporting crampons. Snow gear set aside, we scramble (Class 3) clockwise to the base of our route on the south side. There, another group is just ending their rappel, and we cross-over their bottom rappel point to erect our own protection system. Although it is obvious that nobody will give up at this point for lack of daylight, Dave performs the courtesy of notifying us that, by continuing, we are facing a night hike to camp after coming off the glacier. Although I don't relish cooking supper in the dark, that tradeoff is inconsequential compared with failure to summit. So who votes to continue? There is a certain psychology operating when five men with "type A" personality gather from all compass points to climb a big mountain - and NOBODY is going to back-off for any reason short of injury or suicide. "It's not a real sport unless you can die of massive internal injuries." I suppose that golf and poker would not qualify - yet our efforts certainly do! Needless to write, Dave free-climbs the summit pitch, protecting it in three spots while also using a "bomber" rappel point from previous groups as a fourth. The only true crux is a vertical section, all of ten feet in height, with great exposure to the left and yet with numerous handholds. Dave (left) and Don at the summit. By walkie-talkie Dave indicates reaching the summit at 3:27 p.m.. He fastens the top-end while Ken does similarly for the bottom - now we have a fixed line that climbers use via prussik and harness. The rope is not climbed - it is only there for safety. I go second, and, as I near Dave, he both congratulates and photographs me. One-by-one we climb - Richard is next; followed by Don, and finally Ken. I enjoy one-half a salmon candy and cream cheese sandwich on challah (Jewish egg bread), saving the balance for after the rappel and steep snow. Salmon candy is highly sweetened smoked salmon, and can last many days. Eat your heart out 2007 summiters! Some floatplane makes a flyby, and a jet contrail streaks way above our heads - testaments to a perfect weather day in the wettest spot of all forty-eight states. The very tippy-top is a sharp rock perhaps 15 feet south of the summit benchmark. One naturally passes by it on the final pitch during the nearly level scramble beyond the crux section. I insist that folks touch its top to most properly earn the 7,849 foot prominence of Mount Olympus - tenth largest in the lower forty-eight. Time is a luxury we can no longer afford. It has been played-out to the maximum amount in getting here. No longer in ample supply, we leave sooner than desired; and, after donating one locking carabiner for the cause, I rappel to the start of our rock pitch. I remain there as others rappel, ready to perform a fireman's belay in-case somebody loses control of their descent rate. Downclimbing the steep snow is most cautiously performed; and, after a reasonable break (with sandwich finished), we leave for Crystal Pass at roughly a quarter of six. Our progress is most rapid indeed, reaching the pass in just 20-25 minutes. We head briskly across the Snow Dome, and take a mandatory break just above the steep descent which will be largely iced. I eat my final granola bar for energy, and off we go. We have no ice-specific protection, such as ice screws - and they would have almost certainly been used given the dangerous conditions. I make each step with great care, thinking of nothing else with one exception - the rope's taughtness before and after myself. At the rocks we remove crampons, fill bottles with meltwater, and proceed without hesitation downhill to the Blue Glacier. 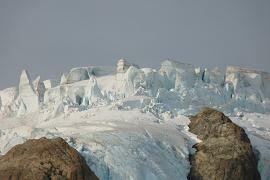 The Blue Glacier is crossed in "record" time, commencing about 8 p.m. and reaching the terminal moraine about 8:45. Streams of the clearest water run everywhere; and there are several 5 foot wide pools of deep, blue water that look perfect for a bath - except for heart-stopping cold. It is truly a surreal landscape, one that you simply have to experience firsthand to understand and appreciate. Dave is dwarfed by the Snow Dome. 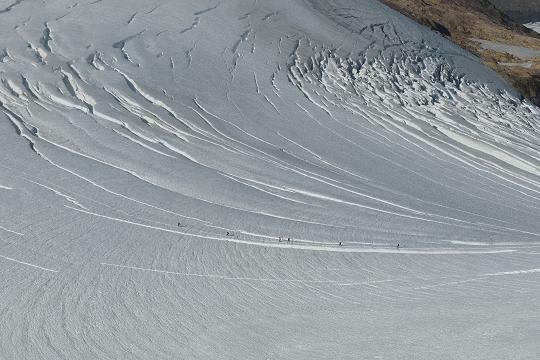 Parallel crevasses make travel "interesting". Sunset is roughly 8:30 p.m., so after crampon and rope removal we have little time indeed for now hiking the steep scree, back uphill, to reach an actual trail before complete darkness. Yet we have made it back to nontechnical terrain. Sweeeeet. It is nearly 9:30 p.m. when we start downhill on the near, camp side of the moraine. I have a headlamp, as do others, while Richard uses a borrowed penlight. The three others are a bit ahead of us when suddenly Richard slips along the trail. What irony - to fall HERE, owing to darkness and fatigue, rather than along the climbing route. Richard has injured his right ankle, and finds it hard to bear weight on that foot. Memories of a similar, nearly identical incident fill my thoughts from two years ago when Dan Baxter fractured his right ankle sixteen miles from the trailhead the day after his successful summit. My heart sinks as Richard's one missed-step suggests a world of pain for himself - and responsibility for the rest of us to get him out safely and in a timely fashion. On the bright side Richard's injury is not as serious - there is no fracture as otherwise he'd be in far greater pain. Richard and I suspect that he has a severe sprain - nothing more. I call to the others. Dave takes Richard's pack. Richard gets medicated with Advil to reduce inflammation. I return to camp with Richard at grandma-pace while he uses my headlamp and I his loaned penlight, arriving around 10:20 p.m.
What a mess: Richard's problems have not ended with the actual climb - they are just beginning. Plus, unlike the summit climb, there is no reward for his suffering. Richard gets right into our tent and I cook supper for him, the bowl of butter noodles placed into his waiting hands as he sits to accept it. I enjoy cooking, and relish the opportunity to help Richard in a manner fitting my abilities and desires. A 200 ml bottle of tequila has been left by three women climbers in the communal emergency shelter we've co-opted as our "kitchen". Enjoying a shot or two, I become a bit giddy, a make a few comments I would not normally utter. I don't retire until just past midnight. This HAS been QUITE a day - one with significant challenge and reward. You cannot buy such a "peak" experience. Nor can it be found around the corner. As with anything truly extraordinary, the price of admission is considerable in time, effort, and emotional angst. Yet climbers always return for the sheer ecstasy mixed with an unhealthy dose of punishment. So the risk/reward tradeoff is not merely acceptable: the experience molds you, even defines you. Without it I am uncertain who or what I would become. A new day. Let's forget the high-minded rhetoric and get down to practical matters: we are 45,000 footfalls from pavement and have an injured man to assist! I am happy to help Richard in ways that I am qualified to - unfortunately I am least able to take extra pack weight from somebody. I can cook. I can do camp chores. I can lead detailed dialogue on topics of common interest. These desirables were all realized last night and this morning. So the expected happens on carrying ten extra pounds to relieve Richard: it is so burdensome that I get a shooting pain down my entire right lower limb when it hits ground going downhill - and as demanded today when we hike out. Even standing with such a load is burdensome. I take an aspirin and hope that I've not exceeded some "orthopedic limit" by carrying out over 60 pounds. Do we really want a second injury? Richard starts earlier as per my suggestion; and I quickly catch him at the rope ladder. He has already climbed it, and I do such in short-order, finding the effort less harrowing than the downclimb (as is always the case). Don and I are to move quicker than the others, reach the Guard Station and let the on-duty ranger know of Richard's situation. However with the added pack weight I cannot maintain Don's pace. He forges ahead while I doggedly head downhill under an increasingly hot day. The combination of sweat and general unwashedness is miserable. At the Hoh River bridge I steer clear of two girl hikers lest they get a whiff of me; stop at the trailhead side, and enjoy a snack of beef jerky and dried fruit. At about mile 12 Don comes the opposite direction, having left his pack at the trail junction leading to our gravel bar camp at mile 10.5. He heads back to take weight from Richard, and I hike, in just over 30 minutes, to a long break as I wait for the others. It is strange: I believe that the plan was to reach the Guard Station at mile 9.1. Don says he is uncertain that Richard could make it that far today. I wait two hours at mile 10.5. I attempt to sleep, or at least rest on my ground pad - but the mosquitoes prevent any of this. I feel terrifically grungy and full of sweat. Everybody arrives, and we head for camp near the Guard Station. Evidently at some point Dave carried two packs - his own plus Richard's - providing him a sample of what it's like carrying over half your weight. WHAT FUN!! 8-( . I wash my entire torso in a nearby stream and change into a fresh shirt. Hey - I nearly feel normal. Richard crashes in his tent that I've already erected, getting macaroni and cheese for supper. Then I cook my own supper with chicken alfredo (yet no chicken). Dave has a treat for myself - instant tiramisu for the backcountry. It is wonderfully sweet. Dave also suggests that I remain behind with Richard on the final walk-out tomorrow. I balk because that means bearing weight for six hours when I can walk at my own pace and be over with it in just three. Besides, I already played this "waiting game" with Dan Baxter the other year! Shortly I realize that I can simply let Richard walk ahead of me after periodic rest stops; I then catch up with him after taking a longer break each time. With that realization I agree to holding-back with Richard. Besides, he is my friend, and so I know exactly what to talk about so as to better pass the time: previous climbs such as Organ Needle in New Mexico, our escapades at Animas Peak, Mount Jefferson of Oregon, and other venues. After a round of silly jokes (and Scottish accent imitation by Ken), that bottle of tequila is polished-off by making tang margaritas. We toast to "MOUNT OLYMPUS!" as I ritually clang drinking bottle with Richard's drinking mug through the tent entrance. We then toast to "BLOSSOM! ", on Dave's suggestion, as it is by now well-known that it is my mother's birthday. Somehow I get a double portion, and I head for bed somewhat happy and satisfied. We arise about 7:30 a.m. and depart in short order, slightly more than an hour. Richard starts first, as previously, and I catch him after perhaps 15 minutes. It is well if he walks at 1.5 m.p.h. since then we'd get out at 1:30 p.m. with plenty of time to change, eat, and then reach our respective evening destinations. Richard's pace improves through the day; and, after Don runs back to retrieve his 20-25 pound pack, Richard walks at a sufficiently quick pace that I am truly comfortable with it given my pack weight. Don also takes about seven or eight pounds of Richard's gear from my pack, and I am revitalized by this "mass renormalization" (a term only physicists would appreciate). Just one mile from the trailhead Dave returns, takes my pack entirely, and walks back with Richard. That's a great favor as it is both unplanned and uses time during which Dave could have simply relaxed at the cars. I scamper back, without any burden other than my car keys in a snack food bag. Somehow everybody independently locates our carpark which is remote from the trailhead and in a confusing maze of campground access roads. We change clothes, wash as best as possible there, and redistribute gear. 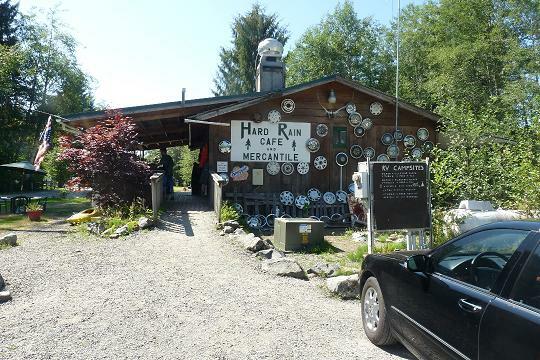 I enjoy a cream cheese brownie with peanut butter, and we caravan 12 miles to the Hard Rain Café as I had suggested all-along for our post-climb meal. I immediately help myself to an ice cream sandwich. Richard expresses his gratitude for our collective assistance by treating us to lunch; and we order from the greasy American menu an assortment of hamburgers, side-orders, and beverages. Last time I was here the "Junior Olympus" was eaten; and I promised myself the "Mount Olympus" after a future success there. That time is NOW, and I enjoy the doubledecker with slices of cheese and "the works". I share a side order of onion rings with Richard who, of course, has his own burger treat. Brought from my pickup truck, a jar of raspberry chipotle barbecue sauce and some feta cheese further adorn my food. Soda pop to drink - no beer available - which surely disappoints my comrades. 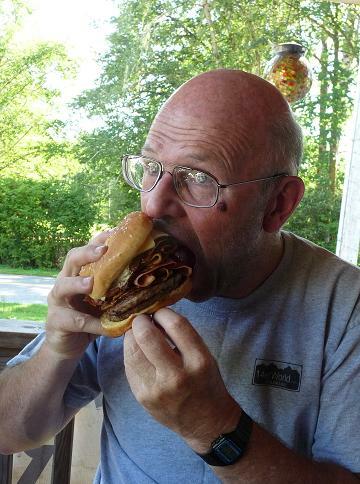 Dave, never outdone in matters of enjoying post-climb dead flesh, orders the largest available item: the "BIGFOOT" with a total height simply too large for fitting into one's maw. Later I urge him to finish it as a "point of honor". Over a final orange creamsicle I shake hands and bid all farewell as we go our separate ways. Richard and Ken head for Port Angeles where Ken's car awaits and Richard will see a doctor. Dave, having flown from Denver, goes in Don's car to Forks for a night there prior to a raft-borne journey off Cape Alava, westernmost point of the forty-eight states. My summer of climbing essentially complete, I drive south for a room in Aberdeen as the first hundred miles of a long way home. Incidentally that violet rope is now mine, having purchased it from Dave at an agreed price. It will save him baggage weight on the airline; and will hopefully see me through many future efforts much as it just has at Mount Olympus. Dave posted this summary in the county highpoint newsgroup. It is included here for completeness. I have used standard font rather than italics for legibility. Yes, as you all know, we were successful. 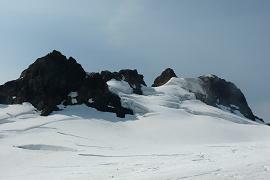 The hot weather and late season date made for hideous conditions on the glacier and the snow (ice). The glacier crossing was interesting, the "Blue Glacier" lived up to its name; all the snow was melted off, and the ice was a lovely tinge of blue on the entire lower expanse of it. Little streams ran down it, little pools were many feet deep with blue water. Very cool. The rock at the far side was simple. 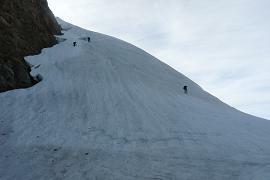 From there, we had to put our crampons on a 2nd time, and ascend the very steep snow dome. Snow? Hah! Ice Dome, we say! Angle was about 40d midway to the top, ascending perhaps 500' before it leveled off. Snow was very hard, actually grey & icy, and we had a hard time getting the pick or spike to go in > 1", a dangerous "no-fall" zone for sure. We walked up the back side of the peak, and were briefed by some locals on our options of how to get to the top. We chose the snowy E shoulder route, donning crampons a 3rd time at the base of it, climbing unroped steeply up above the U-shaped valley about 200', then stepping 3' across a moat gap to the rock at last. We were able to ascend the upward-angled ledge system all the way up to about 75' below the top, at the far NW corner. A quick anchor, with Ken belaying, let me scoot up a ~Class 4 chimney move, then move quickly up the ridge itself the rest of the way, placing about 5 pieces of pro, mostly cams or slings. Adam, Richard, and Don followed via prussik loops, and we belayed Ken up. Great weather allowed us to continue despite a very late hour, and we summited after 4PM I'm ashamed to admit. A quick 75' rapp off the top, with Adam going first and then lending a fireman's belay to others, let us get back down to the snow very quickly. The crux of the whole climb was probably the downclimb of the "Ice Dome" at about 7 PM, with the Blue Glacier still to cross, not to mention re-gaining the Lateral Moraine and heading down the rough trail to Glacier Meadows Camp. The snow had softened imperceptibly, and no one fell. Richard & Adam led my rope down, and Don led Ken down. We crossed the glacier in record time, something 5 motivated guys will tend to do... We reached the top of the moraine as darkness fell, and walked down by headlamp, although Richard's light consisted of just a fading hand held maglite, something that I am certain contributed to his fall and ankle sprain. Well, we eventually all made it out to the cars, buoyed I'm sure by the Tang Margaritas we had at Olympus Guard Station Camp at mile 9 on Night #4. I had the massive burger on the menu at the Hard Rain Cafe, and practically passed out on the ride to Forks to the motel. I have now had a most gratifying summer, scoring N Pal, Lyell, Parsons, and Sonora previously, as well as a few 14ers and 13ers here in CO. I will see Ron T, Nathan, Ken O, Ken J, and others in Durango in a week for some 14er action. Gerry R & I will attempt the famed Sunlight Spire (13,995'; highest 13er), reports to follow. Great to see so many of you fellow COHPers at NJ-09 convention ! PS - Oly was my 200th Western COHP. I now lack only Ritter, White, Shasta, Wood for highest 50, depending upon how you count 'em. 47 / 58 NP HPs. ~50 / 100 NM HPs. 42 / 54 14ers. 31 / 46 Centennial 13ers (highest 100 peaks in CO). Traded visiting NYC harbor Nat Mons on a rainy Sunday for a tour of Woodstock in Bethel NY, a good trade in my book." Visually estimated loss from trailhead to Guard Station - 200 feet. Visually estimated loss just prior to Hoh River bridge - 150 feet. Visually estimated loss at a minor creek crossing before Elk Lake - 15 feet. Visually estimated loss at the (new) rope ladder before Glacier Meadows - 75 feet. GPS-derived loss from top of lateral moraine to Blue Glacier - 220 feet. Visually estimated loss at Crystal Pass - 10 feet. 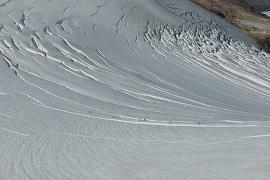 The 15 feet of elevation lost in downclimbing from the high-angle snow to the moat on the summit's north side is not included since in general it will not be encountered by future groups. The net elevation gain is 7,969 - 600 = 7,369 feet. Adding twice the six cited elevation losses, one adds to this figure 2 x (200 + 150 + 15 + 75 + 220 + 10) = 1,340 feet for a total gain of 8,709 feet. I will use the rounded value of 8,700 feet going forward since the precision of my estimates does not warrant more than two significant digits. 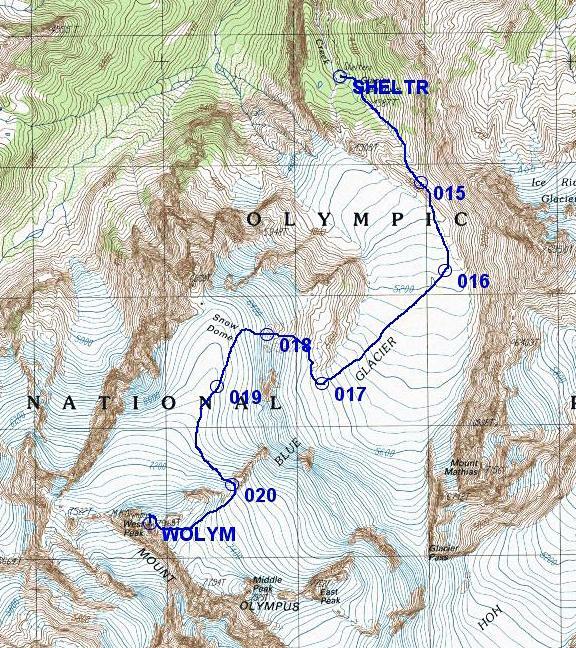 Don Nelsen's GPS-derived total elevation gain is 9,023 feet. The difference of some 300 feet is likely attributed to the GPS unit's account of imperceptible variations in the path elevation that one does not normally include in evaluating total elevation gain. Here, the unit measures all of the ups-and-downs, including just stepping on rocks and walking up and down small ridges of ice. The two values will differ in analogy to the fact that a shorter "yardstick" will inevitably measure a larger coastline distance than a longer yardstick. Fractal geometry provides the mathematical framework for describing and understanding these observations. On the flip-side we have the current rule in the county highpointing community that precludes the consideration of any elevation loss less than 80 vertical feet. The 80 foot value results from the 40 foot contours of most topographic charts for the contiguous states. This rule eliminates considering any of the elevation losses before the Guard Station, and loss at the rope ladder. The resulting total elevation gain is some 8,100 feet. The reader can decide which of these figures is most representative of the total elevation gain. If you feel that elevation gain is a surrogate measure of required effort then, considering that 80 feet is equal to climbing eight flights of stairs, one must discard the latter figure as an underestimate. The following exerpt is taken from an E-mail message Don Nelsen provides regarding the various horizontal distances of our route; and as learned by careful analysis of his GPS data. "Our trip to the summit from the trail junction in the Glacier Meadows campground was 4.63 miles up and 4.67 miles back down for a total of 9.3 miles exactly. (I used red for the upwards track and yellow for the downwards on the map.) That does not count our many minor wanderings enroute so can be considered a minimum distance to bag the peak. and making the grand total 44.7 miles. Everyone hiked more, of course, just getting water, looking around, etc... . Trailhead to Glacier Meadows is shorter than advertised: 16.95 miles one-way." Thus the mandatory total distance is (2 x 16.95) + 9.3 = 43.2 miles. Unless one avoids intermediate camps, which is unlikely, one must add to this figure round-trip camp distances as noted. Thus most climbers will accumulate a total distance of some 44 miles plus any added distance to/from parked automobiles. An ascent of Mount Olympus is not to be taken lightly. As rewards scale with effort, we were all accorded a good measure of both. The climb was particularly sweet for Don and Ken as current highwater marks in their mountaineering careers. The weather cooperated without exception, undeniably a major factor in our success. I thank Dave for largely organizing and leading the climb. This extensive report, no small effort in itself, is my gift to everybody for a job well done.